What made me laugh was the two major errors in the setting. 1. The Firefly could not have come from the LCM as there wasn't enough room for it to get between the life belts. 2. (Biggest sin of all) - the barbed wire was 1/35th scale - so the laugh was on them. What horrified me was the cost. I think the whole thing cost around £65 to make. I did, however, use some new materials and learn some new techniques. The polymorph and Alclad have both added to my knowledge and skills. If you want to see it before it appears at Ipswich IPMS next month, it is in the shop now. Every one brings a kit wrapped and every one gets a number. Numbers are drawn and you choose a box (not your own of course). With my good luck still running, I was the last number out of the hat from 13 and saw all the interesting boxes go. 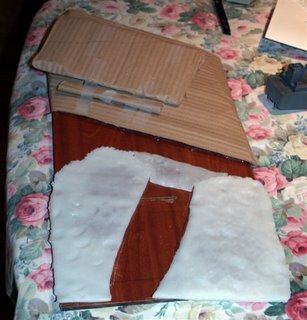 What was left looked like last years 'bad' joke by Jan - an Airfix bi-plane - so I could see an 'interesting' Christmas. As it was the last I had to take it and - blessing - it turned out to be an Metal Modeles 54mm Napoleonic Polish Lancer of the Guard - bought from my shop, no less! As one of my Xmas presents is the new Andrea FAQ for Figures, I am looking forward to doing something I haven't tried for 30 years. That's how long since I made a 54mmNapoleonic figure. I will keep you informed. You know, some weeks, I am glad to be me! Oh, and if I don't see you, have a good Christmas and a great modeling new year. Well there is one day to go and I am close. As you can see, all of the components are finished. I have to fit the figures in place, put down the barbed wire and the tank traps. Lastly, I need some rope for the drop front. We shall see what everyone thinks - I know what I think but then I only had 3 1/2 weeks! The Polymorph arrived yesterday - at the same time as Aaron turned up with his bag :-) As I didn't know how far it would go, that was not a bad thing. Then I forgot to bring it home! Thus, I worked on the rest of the items - I put the life belts in the LCM and used super-glue and MIG earth to simulate puddles in the boat. There is a duffle coated sailor in the wheel house (courtesy of Hecker & Goros). I also put some decals on the Sherman (did I mention the Sherman? No? Well that's another Amourfast kit). I did get a length of transparent sprue - thanks to George, Kev and Chris. Now tonight, I cut up one side of Lifecolor paint rack - for some reason they sent us 5 sides when we needed 3! The Polymorph melts quite well and then I rolled it out. I did it in small sections - the first two had to fit around the LCM to look as though it was in the water. I then used corrugated cardboard to make the beach. Once everything was in place in small bits, I used a hair dryer to melt it all into one. See the pictures. We move on. Tomorrow I will cut it to final shape and put some Vallejo water on it - before that I will put some Games Workshop sand down. Then we have to get some tank obstacles and barbed wire - then we have to get it all together - all before Monday evening - oh well! One Firefly down - much to go! Well I took the Firefly to IPMS-Ipswich on Tuesday. I spent a long time on the diorama part of it - well, 5 minutes. I spent a few seconds rubbing some MIG Russian Earth along the grass where the tracks would have been on the basis they would have torn up the grass. Unfortunately, you can't see that! I have weathered the LCM - photo tomorrow evening if I can get away from the shop before 9pm! I used Lifecolor Tensechrom filters and I think I get on quite well with them. Rust and smoke placed in strategic areas plus some oil washed all over - makes it look quite hardworking. I can't do ay more with that until I make the beach - I am ordering the Polymorph tomorrow. wheel doors so they have had to come off. I am conscious that noone will see the underneath so I am taking a few liberties - maybe I shouldn't tell everyone all of this. The main gear doors don't fit too well so I have had to do a bit of work on them. The fun is that it needs a pilot. At the moment I have chopped up one of the Italeri British Officers. How much that can be seen isn't known at the moment but I am expecting just to get the colours close and hope the canopy covers the rest of the ills. A bottle of wine and the last hour of A Bridge Too Far beckons so that's all for tonight. Well as you can see from the photo, the LCM is painted - at least in its overall colours. Its had a few coats of varnish so is ready for weathering. I am ordering some crew tomorrow. The Firefly is ready and will be coming with me to the Ipswich club tomorrow night. Quite how a 1/72nd Armourfast Firefly will sit on the table with all of the top class stuff I am not sure but I have made it so it goes with me. At least it keeps up my target of always taking something new each month. I did plan to keep the Firefly quite clean as I think that it would not have had much chance to get too dirty on its way to the landing craft but the decals glared out too much so I have dusted it down with some MIG earth. These little Armourfast tanks actually come up quite well - not up to Dragon standards but then you get 2 for £5.50. Back to the LCM. I have done it as a RN boat which was good news as it meant I could skip the PE machine guns. Even so had to use some brass - but we can't be lucky all the time. On this occasion, I didn't do too badly with it. Next it needs a good going over with the Lifecolor Tensicrom weathering filters with lots of rust along the seams and gunge coming out of the bilges. I am getting a 2Kg bag of Polymorph in so that I can have a go at the beach with it. 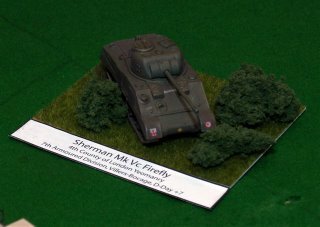 Currently I have a vision of a Sherman up the beach - the Firefly coming off the LCM and a line of infantry laying down needing the tanks to get them on the move again. 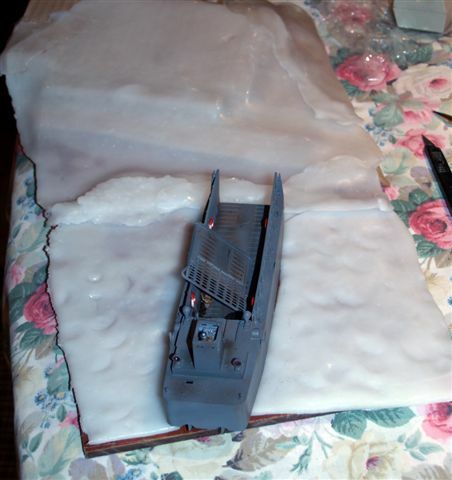 I also want to try to mould the Sherman tracks into the beach so that it looks like it really ran up there. We shall see! Well the STUG is on hold - see later - but a silly thing happened before I did that. Paul (Casson - same name as the guy that shot down Douglas Bader) came in the shop and I was telling him about how my wife Valerie was telling me to add an aluminium barrel. He pointed out that there was one in the shop and I had forgotten - well no surprise there. It was a Hot Barrel version that comes with a resin mantlet. I took it home only to find that it was for an earlier version and didn't fit mine - so we both got it a bit wrong :-( Still this isn't important because I have suddenly found an urgent project - even the BR-52 will struggle to get on its wheels in time for Ipswich club next Tuesday. 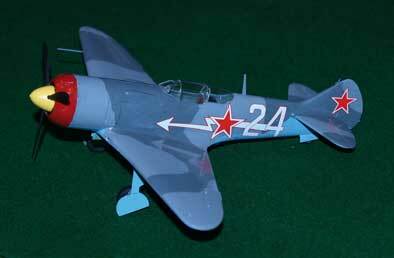 First, the BR-52. I am finding this a bit of a trial because of the huge number of sprues. Also, because of how I was going to paint it originally, I skipped some steps. Its proving difficult to find out what I skipped. Still there aren't many BR-52 experts out there so I might get away with missing somethings. It is also difficult manipulating something as big as this and I am constantly worried about breaking something. I will keep going though! Back to the urgent project. Colchester have a Land, Sea and Air competition every December meeting. I was planning a 1/35th Vietnam trio using the Tamiya Pibber but it never got off the ground, as it were. At the Colchester club night on Monday I realised that I really wanted to do something so I am working on a British D-Day diorama. A Trumpeter LCT landing a Sherman and a Firefly - both Armourfast - on the beach plus a Hobby Boss P-51D in D-Day stripes on a pole coming in to strafe behind the beach. 1/72nd of course. I have all the kits and am half way through the LCT. Nothing clever here - just clean modelling and a bit of 'artistry' - ha ha. I intend to use Polymorph mouldable thermoplastic as a beach base - which will teach me how to use that - Polymorph courtesy of Aaron Spilling - thanks Aaron. Back to the urgent project. Colchester have a Land, Sea and Air competition every December meeting. I was planning a 1/35th Vietnam trio using the Tamiya Pibber but t neer got off the ground, as it were. 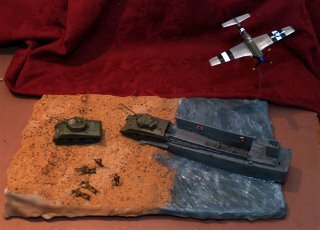 At the Colchester club night on Monday I realised that I really wanted to do something so I am working on a Briish D-Day diorama. One Trumpeter LCT landing a Sherman and a Firefly - both Armourfast - on the beach plus a Hobby Boss P-51d in D-Day stripes on a pole coming in to strafe behind the beach. 1/72nd of course. I have all the kits and am half way through the LCT. Nothing clever here - just clean modelling and a bit of 'artistry' - ha ha. I intend to use Polymorph mouldable thermoplastic as a beach base - which will teach me how to use that - Polymorph courtesy of Aaron Spilling - thanks Aaron. Well, I started the STUG. True to form, I have already made my first mistake. I have followed the instructions like a good little boy and thus have put all of the wheels together. Before fitting them I notice that there was an area on the side of the tub that was showing as having an operation with a knife. Now on the recent JagdPanzer, Dragon wanted you to cut some holes in the sides of the tub. So, thinks I, this is what they want me to do here, so I drill out and make a tidy job of removing an area about 10mm x 5mm in one side. I then go to bed. Next morning am looking at my work and wondering what goes in this hole - surprise - NOTHING! What I should have done is to scrape away a moulded line around the area - not cut it out. Mind you, not much modelling tonight as there is an Ipswich IPMS 'Subby' - Sub-committee meeting tonight at Ransomes so much sitting around and drinking beer. The subby is ostensibly to finalise the arrangements for Telford but as I am not going - got a shop to run :-( - I will be mostly drinking and poking fun. I brought home the recently re-released Dragon Black Widow. I even got hold of the canopy masks. Having struggled with the kit - my fault, and spent two evenings masking up the canopy, I sprayed the first coat of primer - white Lifecolor primer - so now I have white canopy interior framing. I should have painted the canopy Interior Green BEFORE the primer! I then found that my joint around the nose was not the best. Valerie is on one of her 'told you so' trips - grin. The Black Widow is to go back to the shop and be given, in its current state, to anyone who wants it (call if you really want it bad!). I now have a Dragon STUG III which I am going to use to recreate a picture in a new book we have in the shop (name to follow) which shows a Stug pulling a Wermacht T-34 out of the mud. The German T-34 arrives tomorrow. Valerie is now trying to get me to use some brass on it - breaking one of my 'gentle modelling' rules. I am however, going for a brass barrel. Ipswich Club Week. The usual good crowd and a table full of great models. My JagdPanzer looked a bit tame but there we are. 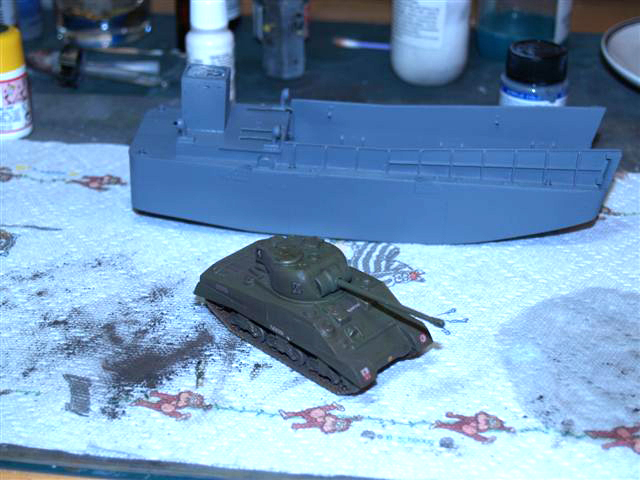 Having finished the JagdPanzer and the 6-hour build 234 I needed something else to do that would interleave with the BR-52/Morser project. Looking around my shop I picked about 8 different items off the shelf and put them all back - Dragon Panther Smart Kit - Sherman Firefly - Academy 1/48th P-38 Glacier Girl (I even took that home). 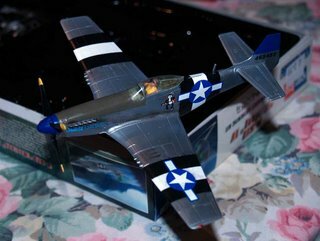 I ended up starting the recently re-released Dragon 1/72nd P-61A Black Widow. I made sure that I ordered a set of masks in my weekly delivery - having had a good look at the amount of canopies involved. I have started it and have got the cockpit done, the fuselage together and the wings on. This seems quite a lot but I am not one to fret over a kit, plus I spend about 2 hours a night modelling so it moves on quite well. Also, the kit itself is nicely moulded with little in the way of filler required. Incidentally, I have brought some Vallejo filler home (it comes in a standard Vallejo dropper bottle) and I am very pleased with it. In the meantime (a sure sign my wife was a way for a couple of days) I managed to move on with the tender of the BR-52 which is now on its wheels. I must say I am avoiding the engine at the moment. I didn't like fitting the pipework, which looks and feels like polypropylene - so requires super glue, which I hate using, so its a bit hands length at the moment. I have to come back to it but not for a week or so. Making this Black Widow reminds me why I moved to making armour - I much prefer to make - make - make - paint - paint - paint, rather then the chopping and changing that goes on with aircraft. Also, I am not brilliant at cockpits so I always feel I have let myself down a bit there. That's all - I will post some pictures when I get further. Well the 6 hour build went off without any hitches. The quality of modelling was great. However, we stll need to get some people to see that finishing the model is the target - not delivering a wonderful cockpit and nothing else! Only 9 turned up out of 14 - that's a shame because we have to buy the kits and spread the cost of the paints, refreshments and room hire over those who book. Next timeit will be pay with booking! Once again, aircraft was the most popular category - we gave them an Eduard Weekend it La-7 in 1/48 and proved that if you work at it you can delivery a very nicely made model in 6 hours. The armour guys got one of the new Italeri 1/72nd Sd.Kfz 234/3. This was simpler in its part numbers but made up for it in fiddlyness. Jan Maes from Cochester won the aircraft category - that guy is a seriously good modeller - whils Kev Baxter won the armour section - I wish he would go back to aircraft and give Jan a run for his money. So I got back from the US and managed to clear the computer problems that plagued my wife and daughter whilst I was away. 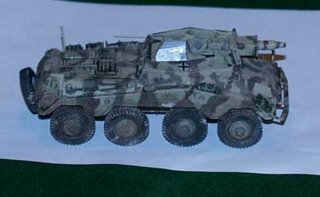 In the last couple of weeks I have been building a Dragon JagdPanzer VI, using it as test vehicle for a new rangeof paints and filters from Lifecolor. The main set used was the new Lifecolor German WWII Tank Colours - Set 1 along with the Tensochrom weathering filters. I have been very please with the results - photos to follow. The rust effect is particularly good. Last night I made my regular trip to North Essex Modellers in Colchester - http://www.nesxmodellers.org.uk. My JagdPanzer was a bit overshadowed by Geoff Wood's T-34 but the contest was won as usual by Jan Maes/Alex Williamson - if ever either of them enters an aircraft they win! For photos of the models check out the web site. For my sins I take the photos and maintain the site. The exciting news this week is the 6-Hour Build. This is sponsored by my model shop. This Sunday it involves 16 people sitting down at 12 and finishing at 6 - in between they make and paint a model of my choice - they choose aircraft or armour and they all do the same kit within that choice. The points at the end favour those who finish rather than those who spend 4 hours on the cockpit. The last one was fun so watch this space. I am in Connecticut, USA at the moment - until Saturday. I have some requests from shop customers for Polyscale and Modelmaster paints so tomorrow we are touring a few shops. I have been to War and Pieces in West Hartford - nice guys - and to Time Machine in Manchester - they have great stocks - but no luck so far. I also wanted to get hold of some Roll Model punches whilst Iwas over here but they were out of stock :-(. I am off to the Green Mountain Railrod in Vermont today - they have some vintage diesel engines running plus some old railroad buildings so that should be fun.